Barring a few exceptions, retailers have not historically invested adequately in modern tools and training for their frontline workforce (store managers, store associates, and other non-corporate employees). An average turnover rate of close to 70% offers the proverbial chicken-or-egg conundrum: will investing in tools and training for the frontline be too costly, or would more engaged employees equal lower turnover? Incisiv, in partnership with Avanade and Microsoft, analyzed 120+ global retailers’ strategic focus, investments and effectiveness in enabling their frontline workforce. The resulting insights form the basis of the industry point of view, “What Digital Forgot: The Retail Frontline”. While only a paltry 5% of retailers can be classified as Leaders in the area of workforce enablement, this group is clearly seeing major improvements in key business metrics, such as in-store conversion (+16%), customer satisfaction (+12%), and on-floor customer time (+9%). Leaders are leveraging mobile for dynamic scheduling and for untethering back room tasks such as inventory management. In addition, by having a mobile-first strategy, Leaders have optimized their applications through single sign-on and remote access for more efficient workflows. From an analytics perspective, while most retailers provide store performance dashboards & reports to their store managers, Leaders are better at assisting store managers act on those insights to make key store management decisions. In addition, Leaders arm store associates with customer behavior and shopping history metrics to provide a more personalized experience for their shoppers. Collaboration and productivity: Leaders are 60% more likely than Laggards to provide collaboration and productivity tools to their frontline workforce, and 40% more likely to be satisfied with their solutions. Customer experience: Leaders demonstrate a greater focus on enabling store associates and store managers through mobility and analytics. An excellent customer experience cannot be built atop a shoddy employee experience. Turnover & retention: Leaders report a 26% improvement in employee retention through investments in technology and training. The direct and indirect cost and productivity impact of reducing employee turnover is massive. 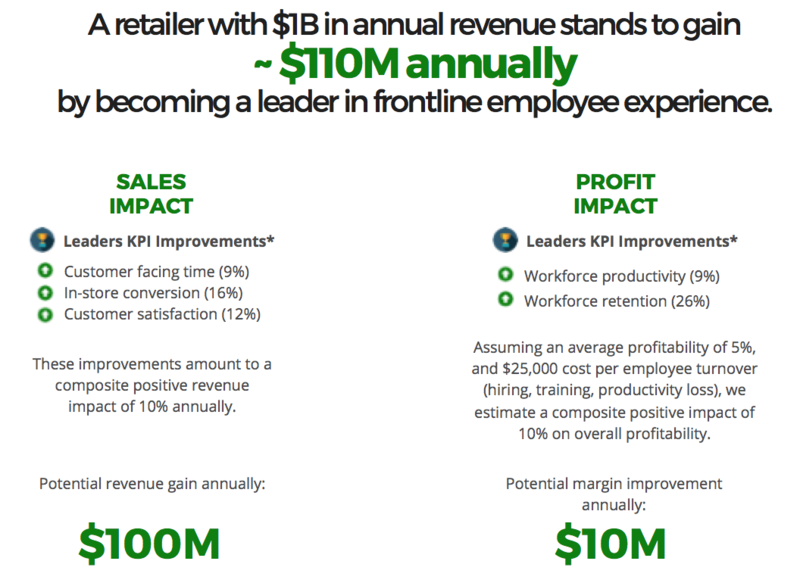 Utilizing insights from our analysis of 120+ global retailers, we built a model to estimate the business impact of the improvements in key KPIs that an engaged and enabled frontline drives: $110M in annual sales and profit impact for a retailer with $1B in annual revenue. Further, a study by Gartner illustrates that companies considered ‘employee experience leaders’ outperform the broader stock market, generating an annualized return nearly double the S&P 500 index. So, why is it that only 5% of retailers are Leaders when it comes to frontline workforce enablement? Laggards and Followers are cramped by “organizational will” – a combination of their culture, a lack of adequate technology investment, and inadequate allocation of those funds towards tools for the frontline workforce. Culturally, many retailers have to overcome their bias that investing in their in-store workforce will not pay dividends - we hope the business case we’ve illustrated helps. Technologically, the drag and cost of maintaining legacy systems keeps many retailers from being able to fully prioritize solutions around workforce enablement. As retailers prioritize improving their customer experience, they must do so on the back of an excellent employee experience, not at the cost of it. 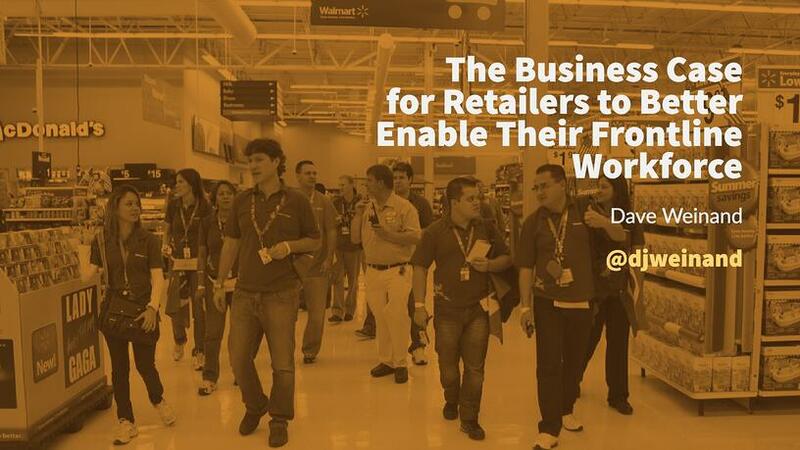 This blog, the industry point of view and an upcoming webinar focus on the business case for a modern retail workforce. The next installment in the series will explore how the lack of arming the frontline workforce with the right tools and training impedes the delivery of a great customer experience. Gaurav Pant recently recapped his thoughts from a masterclass with Jim Sinegal - the storied co-founder and former CEO of Costco. 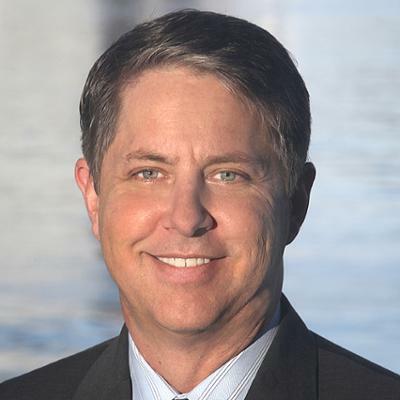 Jim famously asked retailers to turn their inventory, not their people. Over the years, many retail CEOs toasted his success, but few paid heed his advice. It is time they did.